Sennheiser EW 300 IEM G3/E-Band - Evolution wireless in-ear system, EK300 IEM G3 UHF bodypack receiver, SR300 IEM G3 9.5" transmitter, mini-jack earphones output, frequency & battery power display, 1680 switchable frequencies in 42 MHz band, E-Band frequency range (823 - 865 MHz), 21 banks of up to 16 preset frequencies each, adjustable limiter, switchable HF power (10/30mW), pocket receiver with charger contacts for optional BA2015 NiMH battery, pilot tone, squelch, auto tune, WSM support (Ethernet port for frequency management), LCD display with NF peak hold, HF power & channel, 1x BNC antenna connection, 2x jack/XLR balanced combi inputs, 10.5-16V DC power input. 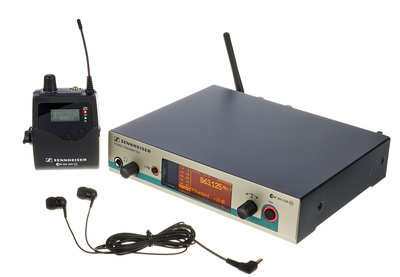 Includes NT2 power supply, 1x IE4 earphone, 2x 1.5 V batteries and GA3 rack kit. Please note: Due to every country having different regulations, you may need to contact your local licensing authorities before using a wireless system.